Download demo version to Import & Convert Excel contacts to Outlook PST Format. 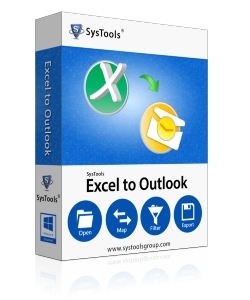 XLS to Outlook converter supports .xls, .xlsx file formats of Excel and helps you convert Excel file to Outlook contacts of all MS Excel applications belonging to MS Excel 2013 and all below versions. When you browse the file to be attached software helps you to avoid any confusion as it only displays Excel files providing XLS to PST. If you want to keep the exported contacts separately in a group of collectively sending emails to this group of people then Excel to Outlook Converter software gives you an option to create & import excel contacts to outlook distribution list or groups and provides a name for it. Convert Excel contacts to Outlook PST using XLSX to Outook Software with a very important and useful option of automatic mapping. This option will auto relate the Excel Fields and Outlook Attributes making the procedure more convenient. If you think that the added attributes are not required you can select it and Remove that attribute within in Excel to PST Converter. Any contacts or details will not be lost or harmed while the transaction. Excel to Outlook contacts converter software manages to safely handle your crucial contacts and no mismanagement of the data will occur. Every related detail from Excel spreadsheet to Outlook Contact List/Group will be exported to MS Outlook just like it was before. By Default Excel Contacts to Outlook Converter will not export repeated contacts on the basis of email addresses but in case if the user wants to export duplicate contacts as well then they can, by checking the option of "Do you like to allow duplicate contacts on the basis of email addresses?" This option will export the duplicate XLSX contacts to Outlook account. The XLS to Outlook Converter is so efficient that user can check the option of "Do you like to allow empty Email Addresses to be imported?" if you want that contacts with no email addresses should also be moved to MS Outlook. Transfer Excel contacts to Outlook even if it does not have email addresses and have other details. Screenshots of Excel to Outlook Converter - How to Use? How Can Import Excel contacts to Outlook 2007 Versions? Yes, To Import Excel file into Outlook 2016/2013/2010 & editions, follow the below instructions. Launch Excel to Outlook Converter. Browse the Excel File stored in the Configured machine. Map XLS File attributes with the Outlook attributes. Check the option to allow/disallow Duplicate & Empty Email Address. Select option to convert Excel to Outlook contacts. View the imported Contacts from Excel to Outlook Profile. Is there any limitation, while exporting Excel spreadsheet to Outlook Contacts List? There is no such limitation applied on XLS to Outlook Converter. User can export an unlimited number of XLS, XLSX contacts to Outlook from Excel Sheet. Can I create a Distribution list in Outlook using the Excel to PST Converter? Yes, You can directly import excel contacts to Outlook into a newly created distribution list. To Export Excel contacts to Outlook PST, Outlook Installation is necessary or not? Yes, MS Outlook installation is necessary into configured the machine, So that Software can easily load the converted XLS Format contacts into Outlook Contact list. How can I convert XLSX to Outlook Contacts List using Excel to Outlook Contacts Converter? While exporting Excel (.xlsx) to Outlook contacts, Can I remove any duplicates email address of user? Yes, During the Conversion process, a user can choose not only option to remove duplicate contacts address to export Excel contacts to Outlook, but also user can avoid empty address filed data to avoid any data integrity issues. While transferring Excel contacts details to Outlook Application, Information such as Email address, phone number & other personal details is secured? Yes, Your data is completely secured, Excel to PST Converter doesn't change any metadata details and field data stored in the Excel Spreadsheet cell. To Import Excel file into Outlook Contacts, Is Outlook installation is necessary? Yes, Outlook application is necessary, As tool directly import contacts of Excel File to Address Book of Outlook. Opening Excel files, finding contacts and then copying it to recipients list became a headache to me. And in urgent needs, it was way too time-consuming. Then I came to know about this Excel to Outlook Converter and within few clicks, I could import all my business and personal contacts from various Excel files to MS Outlook contacts. Thanks for such a wonderful and innovative creation. I attempted few Excel to Outlook conversion tool to import XLSX contacts into Outlook 2013 of various software sites. At the same time, they all falls flat in fulfilling my desires. My companion suggests going with Excel to Outlook Converter software and it works best for me. Finally able to import user contacts list from Excel to Outlook contact group without any difficulty. While importing XLS contacts into Outlook, User-friendly Inteface of the Excel to PST Converter help me a lot, within few clicks, I just import thousands of my addresses and other details perfectly. To import Excel contacts into Outlook Profile, One of the best tool available on Web. The tool is very compact in size but offer amazing features and supports latest Windows Operating system. As manual method took a lot of effort and time to export Excel contacts to Outlook application. Hopefully, Software does this in few clicks. Copyright © 2010 – 2019 www.exceltooutlook.com All rights reserved.